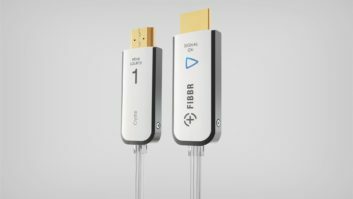 FIBBR will show its new 4-in-1 active fiber optic HDMI cable, in its kiosk at the HDMI Forum booth in South Hall (#20208). The new model features a slim 7mm diameter design and can deliver high-bandwidth transmission up to 50m. FIBBR has also announced the availability of its Ultra8K model for products that can accept a single input/output. The 8K-HDR fiber optic HDMI cable, supporting the new Ultra High Speed with bandwidth capability up to 48Gbps, is made from the high-quality glass fibers, available exclusively from YOFC, the world’s largest fiber producer after a year in development. FIBBR’s Ultra8K and the 4-in-1 cables include BendRobust technology, which allows the fiber to be bent 180-degrees. The Ultra8K and 4-in-1 cables are single-directional, so the connectors are labeled Source and Display ends with a SmartLED indicator on the Source connector to quickly and easily confirm proper connection and operation status. Additionally, Ultra8K, like all FIBBR cables, offers extremely low signal attenuation, and high resistance to external electromagnetic interference.